On 28th June, 2014, in Vadodara, Gujarat, the Power T&D High-end Equipment Industrial Park invested by TBEA Co., Ltd, a Chinese major equipment manufacturer, i.e. TBEA Energy (India) Pvt. Ltd AC 1200kV & DC±1000kV UHV Transformer Manufacturing Base was officially established. On this occasion, company also flagged off one No. 765kV Transformer and three Nos. 765kV Reactors manufactured by this unit to various Power Grid Corporation construction sites in India. As one important part of the Friendship Year between India and China, this project with its ambitious plan and execution of construction, earned high attention from both governments and became the good example for economic & trade co-operation between two countries . Hon’ble Chief Minister of Gujarat Smt. Anandiben Patel, His Excellency Ambassador of China Mr. Wei Wei, Economic & Commercial Counselor Mr. Wang Hejun and approx. 300 technical & commercial experts from power sector of India and Africa, attended this grand Inauguration Ceremony and UHV Power T&D & Renewable Energy Technology Conference. All the guests highly appreciated TBEA’s world class & highly sophisticated factory construction, equipment automation, fully Air conditioned, dust free manufacturing environment, refined production management, high standard employee apartments, canteen, and garden-like campus. At the same time, the guests also thought highly of the exemplary role that TBEA played with the kind attention & motivation from Hon’ble Prime Minister of India Shri Narendra Modi, with the participation of Indian public, with the trust & support from Indian customers, with the day & night efforts from all TBEA employees, the project which was expected to be finished in 36 months, was accomplished within 16 months with stringent requirements of the world class standards and unbeatable quality. TBEA employs approx. 500 persons out of which Indian employees account for 92.6% of the total strength. TBEA simultaneously implemented project construction & employee training. Over 50% employees have gone to TBEA manufacturing base in China, and learned and acquired world-leading 765kV high-end power transmission manufacturing technologies which laid a good foundation for local manufacturing for Indian 765kV Power Grid construction. 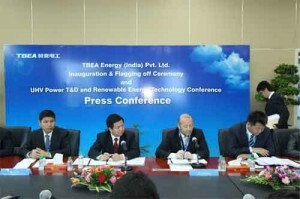 TBEA Co., Ltd. Chairman Mr. Zhang Xin illustrated with confidence “Relying upon this base and through closer cooperation with local partners, TBEA will help Indian customers to achieve green development with energy-efficiency, promote the investment & development regarding renewable energy and integration of power electronics technology in India. As per the requirements of Indian economic & social development, we will gradually bring in wind-solar complementary power station integration technology, solar energy core components manufacturing technology, wire & cable manufacturing technology, power electronics integration technology, as the final phase investment of this project. Our final purpose is to build our TBEA Energy (India) Pvt. Ltd. into a world-class hi-tech industry base, to serve the economic development of India, South Asia and the world”. In recent years, TBEA actively participated in major projects from PGCIL and other customers with its high quality products such as transformers, reactors, HV bushings, instrument transformers, GIS, wire & cables. Especially during the last two years, TBEA has been awarded with over 200 products for 18 substations for PGCIL, NTPC and other state utilities. In addition, TBEA has undertaken 6 substation EPC contracts and the construction of over 100 km cables. All of the above show the trust from Indian people to TBEA. During the process of internationalization, TBEA always sticks to idea of blending in local social & economic development and contributing to the well-being of local people. Water is the source of life. Few days ago, TBEA held the inauguration ceremony for its first local CSR project, viz., water supply project for Miyagam village. This project can provide them with clean drinking water to improve their living standards. In the future, TBEA will be devoting to subsidizing education activity to aid the children from poor families. The establishment of TBEA Green Energy Park is the significant step for the international operation of TBEA. In recent years, TBEA has devoted to sharing its experience regarding the world leading energy-efficient power T&D innovative projects, including China’s 1000kV UHV AC, ±800kV UHV DC, million kW level large nuclear, hydro, thermal power and renewable energy field. TBEA has provided its turnkey project service & system solutions with the combination of survey, design, erection, commissioning, training, operation and maintenance in over 60 countries such as the United States, Russia and Brazil etc.